(b) briefly to examine the extent to which assessment is or should be changing in a digital age. However, assessment requires a section on its own. Probably nothing drives the behaviour of students more than how they will be assessed. Not all students are instrumental in their learning, but given the competing pressures on students’ time in a digital age, most ‘successful’ learners focus on what will be examined and how they can most effectively (which means for students in as little time as possible) meet the assessment requirements. Therefore decisions about methods of assessment will in most contexts be fundamental to building an effective learning environment. I have deliberately ordered these in importance for creating an effective learning environment. The form the assessment takes, as well as the purpose, will be influenced by the instructors’ or examiners’ underlying epistemology: what they believe constitutes knowledge, and therefore how students need to demonstrate their knowledge. The form of assessment should also be influenced by the knowledge and skills that students need in a digital age, which means focusing as much on assessing skills as knowledge of content. Thus continuous or formative assessment will be as important as summative or ‘end-of-course’ assessment. This method is good for testing ‘objective’ knowledge of facts, ideas, principles, laws, and quantitative procedures in mathematics, science and engineering etc., and are cost-effective for these purposes. This form of testing though tends to be limited for assessing high-level intellectual skills, such as complex problem-solving, creativity, and evaluation, and therefore less likely to be useful for developing or assessing many of the skills needed in a digital age. This method is good for assessing comprehension and some of the more advanced intellectual skills, such as critical thinking, but it is labour intensive, open to subjectivity, and not good for assessing practical skills. Experiments are taking place with automated essay marking, using developments in artificial intelligence, but so far automated essay marking still struggles to identify valid semantic meaning (for balanced and more detailed accounts of the current state of machine grading, see Mayfield, 2013 and Parachuri, 2013). Project work encourages the development of authentic skills that require understanding of content, knowledge management, problem-solving, collaborative learning, evaluation, creativity and practical outcomes. Designing valid and practical project work needs a high level of skill and imagination from the instructor. 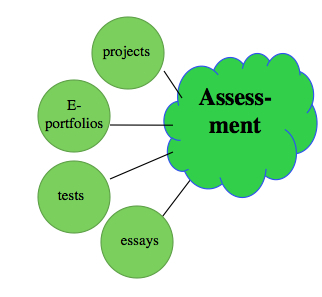 E-portfolios enable self-assessment through reflection, knowledge management, recording and evaluation of learning activities, such as teaching or nursing practice, and recording of an individual’s contribution to project work (as an example, see the use of e-portfolios in Visual Arts and Built Environment at the University of Windsor. ); e-portfolios are usually self-managed by the learner but can be made available or adapted for formal assessment purposes or job interviews. 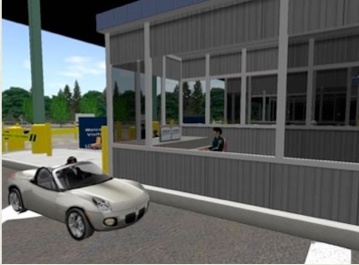 risk taking and decision-making in a safe environment, activities that require a combination of manual and cognitive skills (see the training of Canadian Border Service officers at Loyalist College, Ontario). These methods are currently expensive to develop, but cost-effective with multiple use, where they replace the use of extremely expensive equipment, where operational activities cannot be halted for training purposes, or where available as open educational resources. It can be seen that some of these assessment methods are both formative, in helping students to develop and increase their competence and knowledge, as well as summative, in assessing knowledge and skill levels at the end of a course or program. In a digital age, assessment and teaching tends to become even more closely integrated and contiguous. Activity A. 8 What assessments work in a digital age? there is still a heavy reliance on computer-based multiple-choice tests in much teaching, mainly for cost reasons. However, although there are exceptions, I would argue in general that these really don’t assess the high level conceptual skills needed in a digital age. Do you agree? Are there other methods that are equally as economical, particularly in terms of instructor time, that are more suitable for assessment in a digital age? For instance, do you think automated essay grading is a viable alternative? in Scenario E, ‘Developing historical thinking’, did the instructor use assessment to help develop and assess the skills needed in a digital age in an effective manner? If so, how and if not, why not? A.8 Assessment of learning by Anthony William (Tony) Bates is licensed under a Creative Commons Attribution-NonCommercial 4.0 International License, except where otherwise noted.